Diane drinks three cups of coffee a day, and uses two servings of sweeteners in each cup of her coffee. 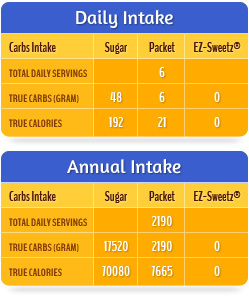 The chart at the left demonstrates the amount of carbs and calories she would intake when she uses different sweeteners. When Diane uses EZ-Sweetz, she always has a peace of mind and full control of the calories and carbs intake in her meal plan.